Left to right, foreground: Davis Whitfield, Antoine Roney. Background: Dezron Douglas and Neil Clark. Photo: Shaheed A Muhammad. The program that Saturday night, November 14, turned out to be a many course, elaborately laid out banquet and we all feasted to full satisfaction. 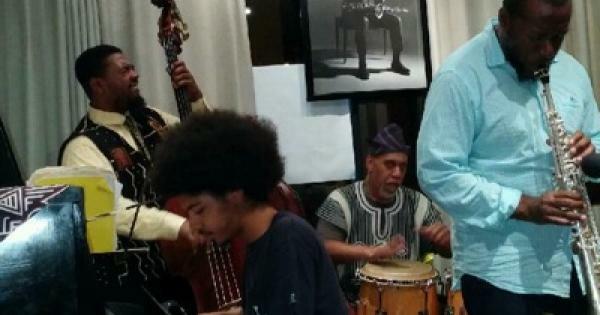 AHMED ABDULLAH, the music director at “SISTAS’ PLACE”, summed it this way: “Every Saturday night here at SISTAS’ PLACE we showcase some of the finest representatives of this culture of jazz, music of the spirit, because here, to us, culture is a weapon”. The set kicked off with the bands rendition of a compilation from JOHN COLTRANE’S “Love Supreme” suite. Picking up his sticks, adjusting himself in his seat this 11- year- old, KOJO RONEY, commenced drumming with the sound, drive and bravado of an old pro. It truly was an exciting listening experience and a sight to behold; straight rhythms and poly-rhythms, KOJO RONEY the Lion Cub of the band had total command of them all.